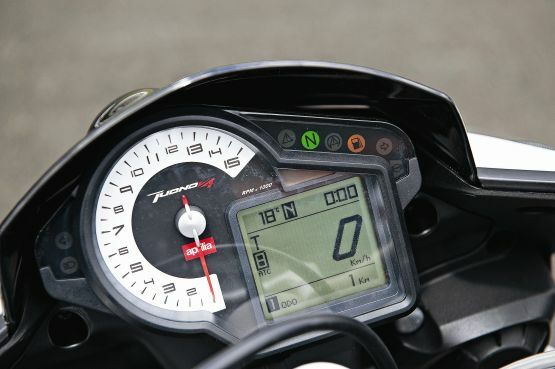 Aprilia’s APRC traction control system is excellent, too, giving a very useful safety net and also making it relatively easy to approach the limit of traction under hard acceleration. Charging out of the tight left-hander on to the long straight, the rear Pirelli seemed to squirm as the dashboard’s TC light flashed, but it was generally the system sensing the imminent loss of grip and adjusting the fuel delivery. The ability to adjust TC level so easily, with a press of left thumb or finger, is a real advantage and something that other manufacturers could learn from. 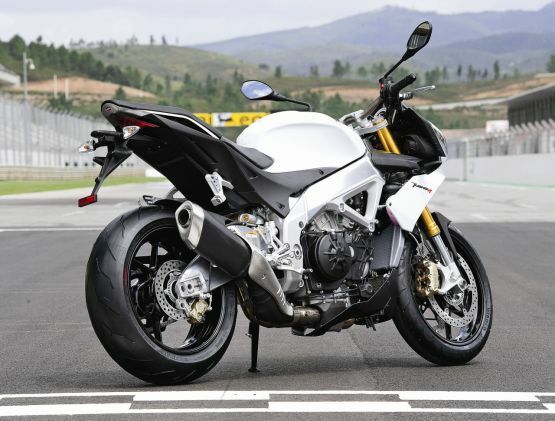 Handling was exemplary once the standard Pirellis were fitted, the Tuono showing no ill-effects from its softer suspension. That’s not surprising, as the difference is only in damping settings, which are easily changed in any case. The track didn’t quite dry out completely by the end of the day, but there was a dry line through most bends, and the Rosso Corsas did a great job of finding grip on the lingering damp patches. I was surprised that the brakes weren’t quite up to standard. There was nothing wrong with the power or feel of the new Brembo callipers, which chomped the 320-mm discs with predictable Monobloc ferocity. But the new ABS system struggled when transitioning from damp to dry tarmac, occasionally letting off the anchors momentarily and allowing the bike to run slightly deep into the turn, on both of the main ABS settings. The Aprilia’s Brembo system didn’t quite seem to match the power and predictability of the similar set-up I’d tried on Ducati’s 899 Panigale the previous day, in wetter conditions. On the damp track I was still glad to have the ABS, but if I’d been chasing lap times I’d probably have been forced to turn it off and take my chances. That apart, I was very impressed by the Tuono — although admittedly not much better informed about its improved road-going ability, because there was no opportunity to test that aspect of its performance. Proper evaluation will have to wait for a road ride, preferably one long enough to show whether the bike’s comfort is a match for its new-found fuel range. 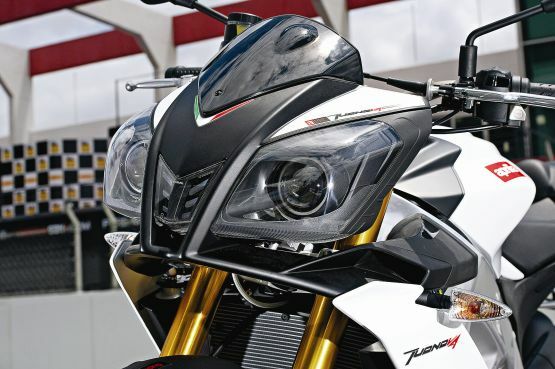 However, the new features should help, and first indications are that you’ll be able to ride the Tuono further (200 km or more, realistically), more safely and with less discomfort than before — as well as marginally faster too. This is a massively entertaining naked roadster that is perfectly capable of starring on a track day, then providing a soft, relaxing, cosseting ride when touring or in town. Sorry, only joking about that last bit. 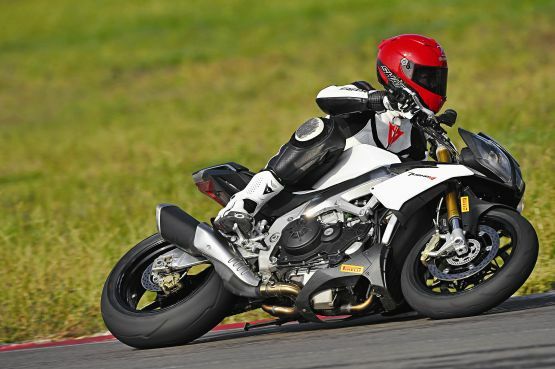 The Tuono is totally up for the track if you are, but it hasn’t gone soft. It’s an even more muscular, more refined but still revvy and aggressive naked party animal that likes a drink, loves to be thrashed and isn’t built for U-turns or going slowly. It’s as exciting as ever, and slightly less mad; which is not a bad combination at all.